The Pitch: Brown Alien Down. The Review: Ever since War Of The Worlds became the seminal work on the subject 100 years ago, science fiction writers and movie makers have been fascinated with the idea of alien invasion. It’s been a rich feeding ground for active imaginations, but ever since special effects became affordable (even if you had to spend eight figure sums on them) it’s been more about the biggest bang for the buck, as the allegorical and satirical traditions of writers get lost in favour of giant spectacle. I like Voltaire and Swift as much as the next man – actually, if you were in the audience for this I’d hazard a guess that I like them much more than the next man there, no offence – but just once in a while it’s nice to let off steam and watch big things get blown up or people shoot other people or things without recourse to character or heavy moralisation. Yes, the ‘c’ word, character – in the rush to see things go boom-boom that’s typically the one to suffer. 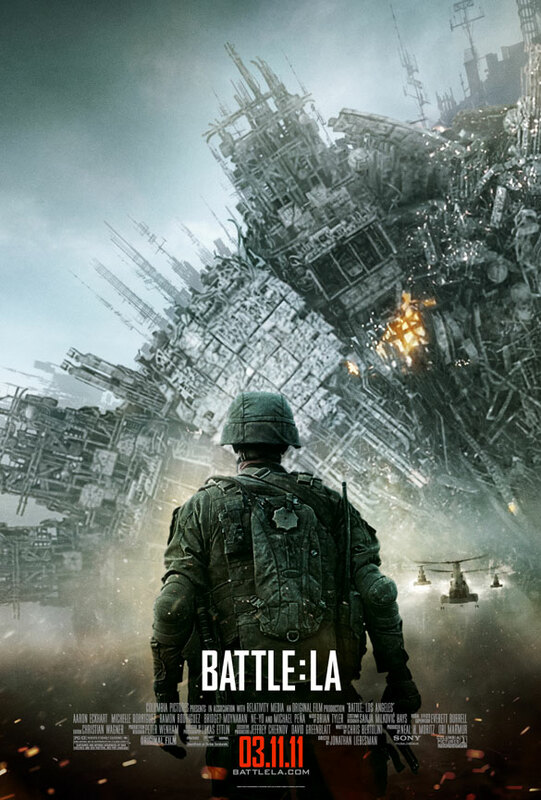 Yet war movies have always thrived on strong, well defined characters, and Battle: Los Angeles is essentially a war movie with alien trappings. Aaron Eckhart has drawn the short straw as the leader of a platoon of soldiers caught up on the front line, but at least he has the benefit of a handful of sketchily written scenes with which to compile something. Battle: Los Angeles marks a new low in the annals of characterisation in film – the rest of our protagonists get one scene, in many cases one line, with which to make an impact, but they should count themselves lucky, for when Michelle Rodriguez arrives later with reinforcements, the character scenes are done and they end up simply reading lines from the script. You wouldn’t feel quite as bad for them if those lines were in any way memorable, or managed to dodge the worst kind of war movie cliche, but criminally there’ not only a lack of any dialogue that’s good, but only two lines that are so-bad-they’re-good that they will linger for more than ten seconds after you’ve left the cinema. There are other familiar names in the cast, including Michael Pena, but I just hope they’re at home sleeping on a mattress made of dollar bills for what they’ve had to endure here. With an almost complete lack of recognisable individuals and dialogue that would make the phone book look like a good read, the only hope would be that you manage to come up with some form of spectacle that’s either regularly visually appealing or at least has some good solid action scenes. Because that’s what we’re here for – right? If you can guess where this is going, then you’ve already put in more thought than the writers. (Well done, you.) There are two shots, neither any more than a few seconds, that haven’t been seen in another alien or war movie – most of the action, if I can call it that without the use of irony, consists of people in camouflage running around on a brown background, shooting at other things lost in the brown murk. For variety, later they run around at night or in sewers, but never will your pulse quicken even slightly. The worst offender is a sequence on a freeway with a bus; what should be an opportunity for some solid action or thrills, or at least even a microgram of tension or spectacle, is so devoid of interest or excitement that it beggars belief. About an hour in, you’ll start recalling all of the other alien invasion movies you’ve seen, not only the various Wars of the Worlds but everything from Aliens to Independence Day, from Starship Troopers to District 9, and then listing war movies should give you something to do should you sit through the rest of this turgid monstrosity. The scary thing is not how many movies are better than this, it’s by how much every single one is better. Notably, most of the great movies you’ll recall have plot, character, dialogue and often a sense of purpose in spades; even Independence Day can be seen as a love letter to colonialism and the American Way. About all Battle: Los Angeles can do is come across as an attempt to justify the US treatment of prisoners in its care – we should expect a galactic Geneva convention prior to any actual invasions if they’ve seen this. Slightly offensive in its intent, but earth-shatteringly offensive in its complete and total lack of anything even vaguely worthwhile to do or say, if this is the best the human race can manage now, I suggest we don’t put up a fight when the alien invasion comes. Why see it at the cinema: If you hate your eyeballs that much, or have a few stubborn brain cells that just won’t die, then be my guest. Otherwise, avoid at all costs. This entry was posted in Reviews and tagged Aaron Eckhart, alien invasion, boredom, Jonathan Lieberman, Michael Pena, Michelle Rodriguez, war movie.